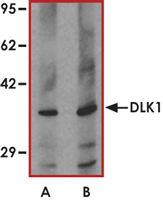 Sample Data :Western blot analysis of HepG2 in 293 cell lysate with DLK1 antibody at (A) 1 and (B) 2 ug/ml. Scientific Background :DLK or mitogen-activated protein kinase kinase kinase 12 is a transmembrane protein containing six epidermal growth factor repeats and is a serine/threonine protein kinase. DLK is involved in the differentiation of several cell types, including adipocytes. DLK plays a role of a tumor suppressor protein and is predominately expressed in neuronal cells. DLK as an activator of the Jnk pathway. Overexpression of DLK results in activation of Jnk1 and the accumulation of a hyperphosphorylated form of c-Jun (1). Postnatal loss of DLK in stem cells and niche astrocytes has been shown to regulate neurogenesis (2). 1. Hirai, S. et al: Activation of the JNK pathway by distantly related protein kinases, MEKK and MUK. Oncogene 12: 641-650, 1996. 2. Ferron, S. R.et.al: Postnatal loss of Dlk1 imprinting in stem cells and niche astrocytes regulates neurogenesis. Nature 475: 381-385, 2011.